Tough one for me. I can’t eat peanuts. Not allergic, just don’t like them. I’d love it if someone made peanut brittle without the peanuts! I guess that would simply be “brittle.” So the lovely wife gets the tough assignment of sampling Brittle Brothers’s brittles for me. Let’s see what her comments are. There you go. 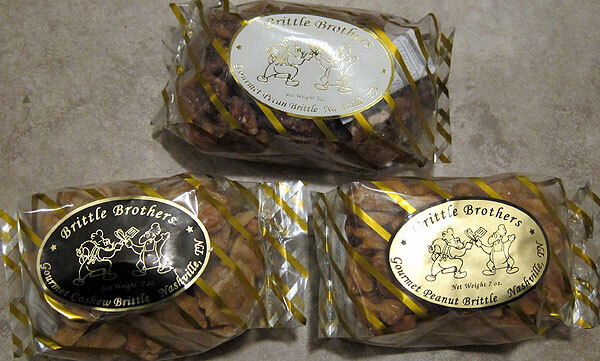 Brittle Brothers sounds like a winner, for those of you who eat nuts… I’m going nuts because I want some non nut brittle now. Brittle Brothers is a Nashville based company that makes many kinds of brittle in a variety of packaging and size options. Product offerings include brittle in bags, tins and Christmas gift formats. Click to visit the Brittle brothers website.